VertiGo is a wall-climbing robot that is capable of transitioning from the ground to the wall, created in collaboration between Disney Research Zurich and ETH. VertiGo is a wall-climbing robot that is capable of transitioning from the ground to the wall, created in collaboration between Disney Research Zurich and ETH. 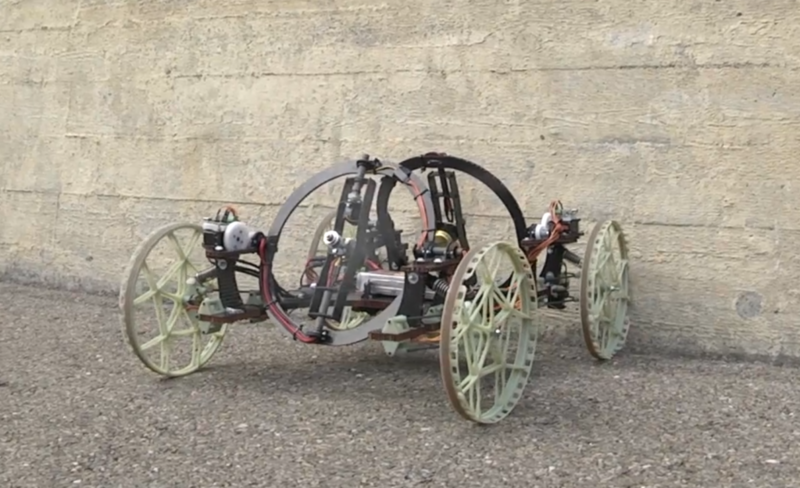 The robot has two tiltable propellers that provide thrust onto the wall, and four wheels. One pair of wheels is steerable, and each propeller has two degrees of freedom for adjusting the direction of thrust. By transitioning from the ground to a wall and back again, VertiGo extends the ability of robots to travel through urban and indoor environments. The robot is able to move on a wall quickly and with agility. The use of propellers to provide thrust onto the wall ensures that the robot is able to traverse over indentations such as masonry. The choice of two propellers rather than one enables a floor-to-wall transition – thrust is applied both towards the wall using the rear propeller and in an upward direction using the front propeller, resulting in a flip onto the wall.